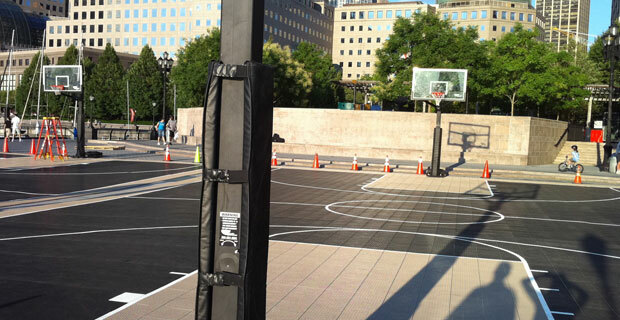 Basketball Courts on the Esplanade?! Basketball Set for Sony Pictures "Friends With Benefits"
…and for all the volleyball lovers, don’t worry your net is coming back. Justin Timberlake fans, on the other hand, pay attention. The esplanade space located immediately south of the North Cove Marina will be a film set for the Sony Pictures movie, “Friends With Benefits” starring Justin Timberlake. The basketball court will obviously not be for public use, but you can be sure to catch a glimpse of the actors putting up their best lay ups for the next two days. The film purportedly stars Mila Kunis, Emma Stone, Cam Gigandet, Patricia Clarkson, Lisa Kudrow, Thomas Haden Church and Stanley Tucci. Co written and directed by Will Gluck, Friends with Benefits is about the relationship between two good friends (Timberlake and Kunis) who take it to the friends with benefits level, who surprise surprise — are secretly in love. Which obviously ruins their good thing. For those who live on South End Avenue, the taxi stand will be parking for the movie set trucks. Parking on either side of South End Avenue between Liberty and Albany Streets will be limited during the next two days. Not quite sure how basketball plays into this, but if you happen to catch the filming of the scene between today and tomorrow, let us know in the comments!